With the needs of these students in mind, the practical side of the subject has been emphasized throughout the book. This method, it is believed, will sustain interest in the subject by showing its application to everyday affairs. More space than usual has been devoted to the treatment of Force, Torque, Translatory Motion, and Rotary Motion. 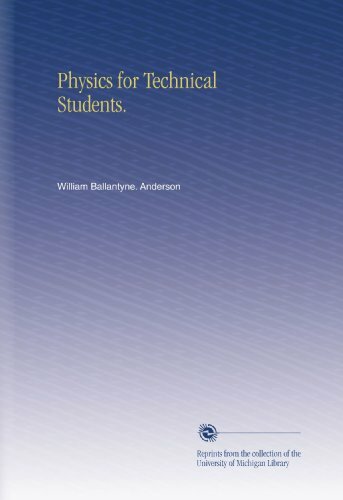 Table of Contents: Prefaces; Mechanics (Kinematics, Dynamics, Energy, Rotational Motion, Planetary Motion, Periodic Motion, Fluids); Thermal Physics; Waves and Optics; Electricity and Magnetism; Modern Physics; Foundations. Contents: Science and the Scientific Method; Physical Laws; Energy; Probability; Waves; Electromagnetic radiation; Electric and Magnetic Fields; Entropy; Second Law of Thermodynamics; Statistical Mechanics; Quantum Theory; Atoms; etc.